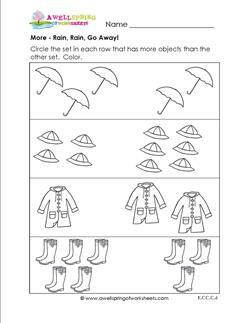 Using terminology similar to greater than and less than, these more and less worksheets allow children to practice their counting skills and evaluate which set of objects is, you guessed it – more or less than the other set. 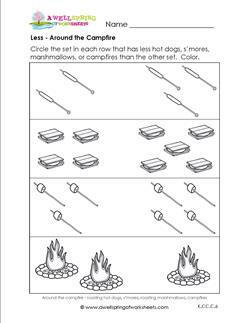 Each worksheet has four problems in enjoyable themes kids are sure to resonate with: rain, campfires, cars, and blocks. 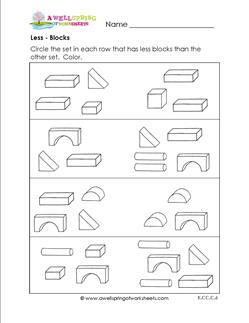 If needed, kids can write the number of objects they just counted in the margin next to each set. 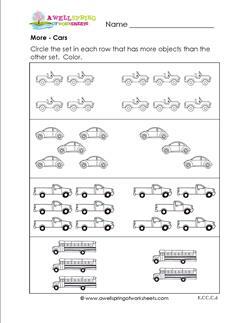 Jump in and take a ride in one of these cars - a jeep, a bug, a truck , or a school bus in this more worksheet. Circle the set that has more than the other set. It would be perfect if it was a rainy day for this more worksheet. Don't sing in the rain, circle the sets of rain gear that has more than the other set! Color. No hard hats needed here. We're just going to pretend to build with these blocks. Circle the set in each row that has less blocks than the other set. Color. What buildings can you see?